At least 5 percent of the comets orbiting our sun may have been stolen from other stars, scientists say. Our solar system is thought to include trillions of comets — small chunks of rock and ice — that circle the sun in a spherical swarm called the Oort cloud, a region that extendsabout 100,000 times the distance from the Earth to the sun in any direction. The average distance between the Earth and sun is 93 million miles (150 million kilometers). Now scientists suggest that many of these bodies may actually have originated around other stars and were snatched up by the sun's gravity during a close swipe sometime over the past 4 billion years. "It turns out it's much more frequent than in fact even I would have guessed," Levine told SPACE.com. By looking at the number and spread of stars in the sun's neighborhood, the researchers found that other stars would pass reasonably close by the sun every 1 to 2 million years. That means that the sun has probably had between 10,000 to 50,000 close encounters over its lifetime. And any one of these could easily have caused the sun to gain or lose comets, the simulations suggest. The researchers calculated that at least 5 percent of the Oort cloud comets are likely to be adopted from other stars, though the true figure could be much higher. And the encounters were probably two-way transactions; just as the sun may have gained new comets, it just as likely lost some of its own. "I might not be able to say we have increased the size of the Oort cloud, but we have probably exchanged material at least, so that some fraction of what's in our cloud probably did come from something else," Levine said. Testing this hypothesis could be difficult, though, the scientists cautioned. For one thing, we cannot be sure other stars even have Oort clouds of their own, as tiny comets would be too dim to detect around any star but the sun. However, Levine said there's no reason to believe our sun is unique in this trait. Furthermore, it could prove tough to identify any particular comets around the sun that may have originated elsewhere. One possibility is to study the chemical composition of the sun's comets to see if they match that of the sun. If not, they may have formed around other stars with different chemical abundances. The researchers said the general idea that some of the Oort cloud members may be interlopers does make sense. 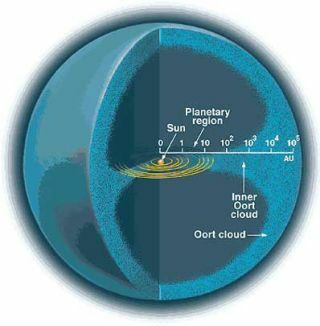 For one thing, the sun seems to have more comets in its Oort cloud than were predicted based on calculations of how much mass was thought to originate in the sun's close environs when it was forming. Gosmeyer presented the findings in a poster at the 219th meeting of the American Astronomical Society in Austin, Texas in January.